I think the leader of Swindon Borough Council and hiscabinet team of ‘Bluhligans’ don’t want their, (anticipated), refusal to answer my Freedom of Information request to be discussed before the Full council meeting on the 23rd September 2010. The Council has a duty to respond promptly or no later than 20 working days, which in this case is today. However, as in this case, if a qualified exemption applies to the information and the public interest test is engaged, the Act allows the time for the response to be longer than 20 days, and the information must be supplied within what is considered a `reasonable’ time scale considering the circumstances of the case. We are currently considering your request for the report under Section 36 Freedom of Information Act 2000 exemption. (2) Information to which this section applies is exempt information if, in the reasonable opinion of a qualified person, disclosure of the information under this Act…. In the meantime I have attached a link to the Special Cabinet Report dated 31 March 2010. The report set out the position relating to the Group Director usiness Transformation’s involvement in the Wi-Fi Project and is available via the Council’s website. We anticipate we will be able to come to a full conclusion no later than 27 September 2010. 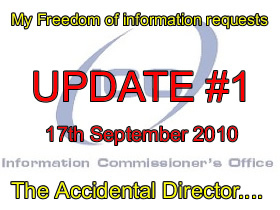 Considering that my FOI request concerns the ‘effective conduct of public affairs’ at Swindon Borough Council I think the Information Commissioner, (when this inevitably ends up on his desk), may raise an eyebrow at Section 36 being employed by the Council to hide the embarrasment caused by the conduct of a publicly employed Director of the Council. Without the public having sight of the report I have requested, how can it know whether Hitesh Patel is only incompetent and not also dishonest? Without sight of the report how can any of us know whether Hitesh Patel is the only one? At present I imagine Hitesh Patel, Gavin Jones and Roderick Bluh are wondering how many of us already know quite a bit about the report, and are even now biting their nails nervously wondering if they could, or should, risk releasing a doctored version of it to satisfy the FOI. How many people on the ‘inside’ may have already blabbed?…. Far from being irritated by this I find myself looking at the calendar and thinking that the longer SBC tries to avoid answering the questions, the worse it will eventually be for most of those involved. I also think that the lies and half-truthswhich were deployed at an early juncture are now taking an increasing amount of effort to sustain. Their last line of defence would seem to be the outright refusal to answer legitimate questions. SBC passed this point some time ago when the Deputy Leader of the Council, (himself a Director of Digital City (UK) Ltd and supposedly Swindon Borough Councils representative in Digital City’s boardroom), flat out refused to answer Councillors questions regarding the company, now the Officers seem to have caught up. …in short, playing with anything other than a straight deck of cards is risky for them. Not one of them can be sure that on the next hand we won’t kick the table over, shout ‘Cheats!’, and then proceed to prove that they’re cheating…..
….so I think they’d like to avoid dealing the next hand entirely, but also realise that the longer they delay means more people will cram into the saloon to watch the end of the game, especially if the last hand is dealt at the insistence of the information commissioners gun barrel. Anyway, to continue with the frog boiling , I’ve also heard back from Companies House regarding Mr Patel’s ‘Accidental Directorship’. It makes for interesting reading and I’ll put it into context in a later blog post.